Shopping for the top bargains for your Lexmark laser toner cartridges? If your laser printer is running out of laser toner then you can get great cost savings simply by purchasing all your new Lexmark C935-hdn toner provider. Considering our competitive pricing and our low price guarantee, you can rest certain of enjoying the best possible bargain for Lexmark C935 hdn toners. Additionally, we only ever supply Lexmark C935hdn toner cartridges which are high engineering quality and additionally low in cost and so why be satisfied with anything less? Get Lower Deals Today For All Lexmark C935 hdn Toner Cartridges! You can save cash on account of speedy and free delivery for all Lexmark toner cartridges. This specific lower priced Lexmark C935hdn toner could be bought just by visiting our secure shopping checkout so don't delay and buy as soon as you can for the chance to make significant savings. Cartridge Save a courteous team of advisers that will always make sure that buying Lexmark C935-hdn toner cartridge will be a speedy as well as uncomplicated process. Customer care is Cartridge Save's primary concern so we provide you with a full cash back guarantee for Lexmark C935 hdn toners to provide you with total peace of mind. To find the cheapest offer on Lexmark C935hdn toners order right now from Cartridge Save. 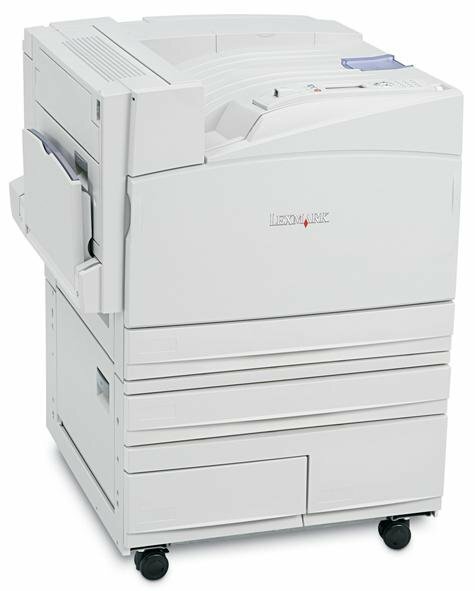 The Lexmark C935hdn is a heavy-duty printer ideal for medium to large-sized offices. It boasts 2400 dpi image quality and can handle 200,000 pages per month. The recommended monthly page volume is 2,500 to 33,000 pages. The Lexmark C935hdn is known for its high paper handling capacity and wide range of document finishers. The C935hdn can handle media as large as 11 x 17 inches. The Lexmark C935hdn colour laser printer could have been better if it had standard Wi-Fi and if input paper handling capacity could be expanded. The large Lexmark C935hdn printer measures 853 x 650 x 710 mm and weighs 121.1 kg. The control panel is organised and features a small LCD display. For connectivity, USB and Ethernet ports are provided. The Lexmark C935hdn wide-format printer also has a slot for USB flash drives. Standard input capacity is 2180 pages while standard output capacity is 400 pages, which can be upgraded to 3,500 pages. This impressive printer has very quick print speeds and delivers high-quality prints; it prints black and white in as fast as 45 ppm and coloured prints at 40 ppm. For the convenience of workgroups, built-in Ethernet is available. The Lexmark C-935hdn is compatible with Macintosh and Windows computers. Users can easily print from flash drives, thanks to the USB port. The four separate Lexmark C935hdn cartridges contain plenty of toner with the colour cartridges averaging approximately 24,000 pages each. The Lexmark C935hdn laser printer as well as its consumables and add-ons are quite pricey. This model does not support Wi-Fi.